Catalogue Edition 22 is here! Here at Saneux we've been doing things differently for more than 2 decades. Based in London, UK we have been in the epicentre of the architectural and interior design community - constantly drawing inspiration to create bathroom products and concepts that break out of the ordinary. The FRONTIER range was created with choice and versatility being at the forefront of the R&D process. We know every bathroom is different, which is why we want to give you more choice than ever before. Being our most modular range, FRONTIER is available in 3 colours and sizes all with a delicate hand painted finish, and a variety of optional extras to personalise your unit to suit your style and bathroom needs. The new VOLATO mirror will become the perfect centerpiece in any bathroom thanks to it’s unique ceiling mounted look whilst actually being wall-mounted. With a smooth, matte black finish, the VOLATO mirror can perfectly accompany our new matte black brassware from our COS, TOOGA and FUJI collections. Precision made. Designed for life. Launched in 2017, the Zaha Bath from the Agua Maison range of free-standing baths has been a quintessential statement of elegance for the modern bathroom. Precision built, this free-standing bath is made from Solid Surface - an organic material designed for durability and comfort. 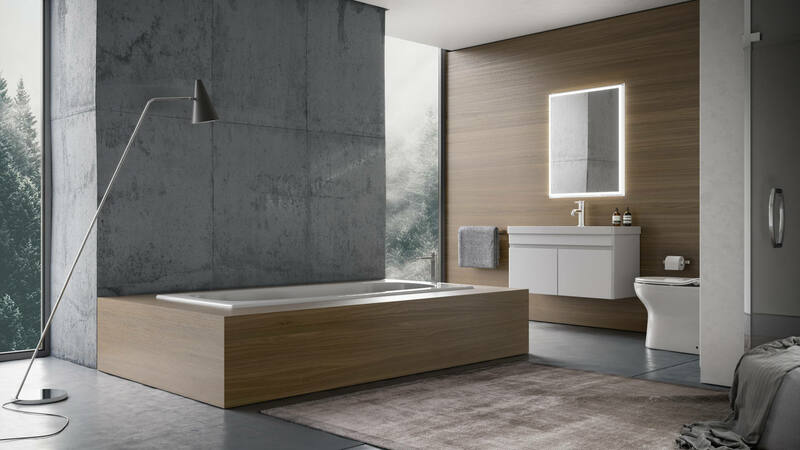 At Saneux we do our best to present you with the finest bathroom design ideas that will help materialize your ultimate modern bathroom fantasies. We provide you with a variety of inventive products that cater to different contemporary bathroom styles and give you the tools to design your own bathroom space and make it truly unique. Our bathroom designs are created with our customers in mind. We offer top quality bathroom furniture and accessories, providing excellence, from the design stage, through the manufacturing process and installation. We care for even the smallest details and that’s why our products are distinguished by their quality and longevity. When it comes to innovation, at Saneux we don’t hold back! We welcome change and we grow by exploring fresh and contemporary concepts, satisfying the gaps of the ever- growing industry. We take pride in developing new exciting ideas and products with innovative design and leading edge solutions. As an ethical and eco-friendly organization, Saneux takes environmental consciousness and equality in the workplace very seriously. We take action by creating WRAS approved products, introducing recycling in our production process and creating a healthy and pleasant environment for our staff, among other things. Saneux has been regarded as the best, well-kept secret of the construction industry when it comes to bathroom design. Based in London and with offices in Valence and Paris, we cater for some of the most prestigious developments around Europe. With stocks readily available for delivery, we always achieve an outstanding experience for every contract client. We are now on Virtual Worlds; the virtual reality experience which allows you to visualize your perfect bathroom in 3D and 4D. Many of our ranges are featured including our new FRONTIER furniture range and our popular AUSTEN and MATTEO collections.